Quantum Relativity is part of the on-going story of man's attempt to understand the rules of the universe, particularly the laws of gravity. Newton was never satisfied with his theory. The idea that the Earth pulls on the Moon with no visible or mediating agent is called action at a distance. Newton never thought this idea was credible, but he was unable to find any alternative. Newton's theory of gravity is quite good - NASA uses it almost exclusively for all orbital calculations, and it works just fine. However, very small numerical problems with his theory were found over the years. 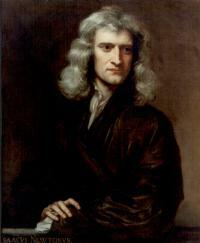 Also, Newton's theory was heavily criticised on philosophical grounds. Newton's theory presumed there were special observers, called "inertial observers," who were the only ones to see the laws of physics in their pure form. In 1899, Max Planck first introduced the quantum hypothesis. Up until Planck, it was thought that anything could be divided into smaller and smaller segments without limit, but still retaining the basic characteristics of the substance. It's hard to understand this from today's viewpoint, over 100 years later, but in 1899 the idea of atoms was still controversial. Planck introduced the notion that the electro-magnetic field could only be made up of small indivisible units. Quantum mechanics is a very strange theory, based on the observation that atomic particles often can be in one place or another, but not in between. Quantum mechanics was developed by several people, culminating in a comprehensive theory released by Werner Heisenberg in 1925 and Erwin Schroedinger in 1926. However, almost immediately it was realized that quantum mechanics was an incomplete theory. Quantum mechanics could not accurately account for electro-magnetic forces, and quantum mechanics violated the laws of special relativity. In 1948, quantum mechanics was replaced by a new theory simultaneously developed by Richard Feynman, Sun-Itiro Tomonaga, and Julian Schwinger, called Quantum Field Theory. Quantum Field Theory remains today our best theory of electro-magnetic forces, and is our current theory for the nuclear force and the radioactive force, more often called the strong and weak forces. Brownian Motion - after this paper was published, everyone agreed that matter was made up of atoms. The atomic theory is perhaps the most fundamental part of quantum mechanics. The Photo-Electric effect - in this paper, Einstein coined the work "photon," and put us firmly on the road to quantum mechanics. Special Relativity - in this paper, Einstein explained that the speed of light was an absolute constant. Everyone who measures the speed of light will get the same number, regardless of how fast they are moving and how fast the light source is moving, and nothing can go faster than light. Special relativity tells us that space and time do not exist as separate entities, as Newton thought, but rather as one union, which we call space-time. Any one of these three papers would have been enough to ensure that Einstein became known as a superb physicist. The three papers published in one summer were enough to set him aside as someone special. However, Einstein was not by any means done creating. Einstein realized almost immediately that his theory of Special Relativity had a serious flaw: gravity could not co-exist with his new theory of space and time. So, almost immediately Einstein set out to find a new theory of gravity, a theory to replace Newton's. In 1916, 11 years later after special relativity and 230 years after Newton, Einstein published his theory of gravity, the General Theory of Relativity. In order to create this theory of gravity, Einstein had to change our notions of space and time yet again. Einstein had to postulate that we lived in a curved space-time, just as we live on the curved surface of the Earth. Einstein showed that there were no such things as Newton's inertial observers. Also, General Relativity is what is called a field theory, so Newton's spooky action at a distance was also gone. Just as Newton was never satisfied with his theory of gravity, Einstein was never satisfied with General Relativity. Einstein was disturbed by two problems: he believed that there should be just one theory to account for both gravity and electro- magnetism, and he believed that this "unified field" theory should get rid of quantum mechanics. 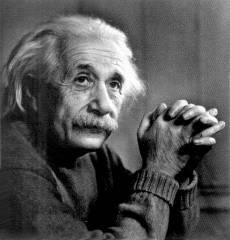 Although Einstein himself helped create quantum mechanics, he hated quantum mechanics until his death. One interpretation of quantum mechanics is that everything is uncertain, and everything is fundamentally governed by the laws of probability. Einstein particularly despised this notion, frequently asserting "God does not throw dice!" Gravity as we currently understand it cannot be reconciled with the laws of quantum mechanics. Since 1930, people have tried to invent a theory of quantum gravity. I believe Enrico Fermi was the first to propose a theory of quantum gravity, in 1931. However, Fermi's theory predicted that all forces were infinite, and therefore the universe could not exist. Most physicists think the universe does in fact exist, so it was thought that the theory of quantum gravity had some serious problems. Shortly after quantum field theory was invented, people started trying to invent a quantum field theory of gravity. Very quickly, it was shown that this is impossible: there can be no theory of gravity which obeys the rules of quantum field theory. The quantum theory of fields simply will not work for a force with the properties of gravity. It was recognized that a completely new type of theory was required. Since this theory does not currently exist, no one is certain exactly what it looks like. However, most people presume we need a new theory of space and time which will be compatible with the laws of quantum mechanics as we know them, and somehow allow a theory of quantum gravity to exist. This new theory of space and time is often called Quantum Relativity. This web site is all about these theories.